Over the past day and a half, Americans across the nation who believe Donald Trump was not the legitimate winner of the 2016 election have mobilized behind a recount effort spearheaded by Jill Stein. 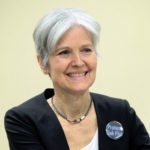 She was the Green Party candidate and she got very few votes in comparison to Trump or Hillary Clinton, but she’s still eligible to file for a recount in Wisconsin, Michigan, and Pennsylvania – she just has to pay for it. Those happen to be the three states where Clinton lost by a razor thin margin, amid various irregularities. Millions of dollars have poured in already to fund the recount effort. Jill Stein initially announced that she would need to raise two-plus million dollars more or less immediately in order to pay the combined recount filing fees in the three states. But as her own supporters were joined by those who supported Hillary Clinton and Bernie Sanders, along with those who simply believe Donald Trump stole the election, the money quickly poured in. By the end of the first day, Stein had already reached the $2.5 million short term goal – and has now surpassed it. As Stein had stated all along, she’ll also eventually need millions more to pay for attorneys fees and observer costs, as statewide recounts are massive undertakings – and the states themselves won’t pay for it. As of early Thursday afternoon, the fundraiser has now surpassed the four million dollar mark, even as she estimates she may need a total of six to seven million dollars in the end – a number which she appears well on her way to reaching. Meanwhile in Florida, where only the state’s Secretary of State Ken Detzner can call for a recount, a petition is well underway to try to make that happen. This comes even as Wisconsin now says it’s preparing for the Stein-funded recount.